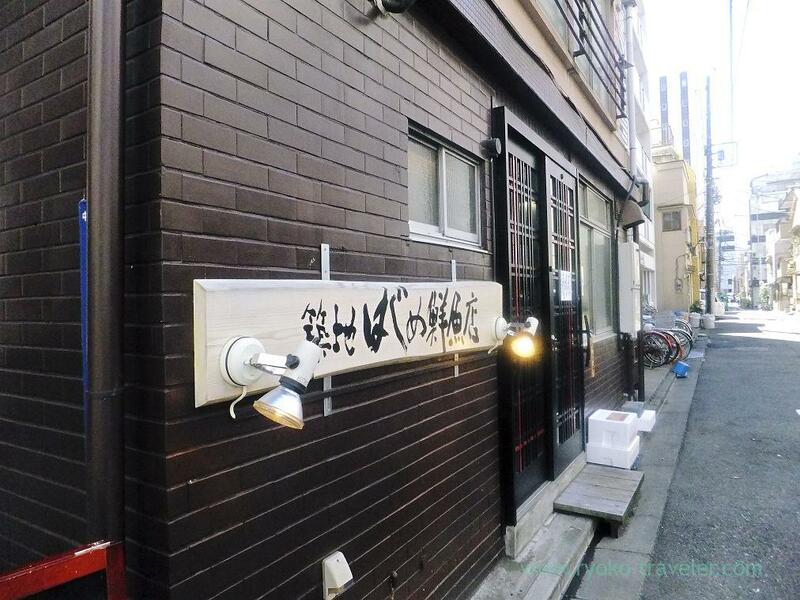 Hajime Sengyo-ten is the farthest lunch spot from my office. It is my limit. The chef serves only 20 lunch sets on weekday’s lunchtime. Stand-up-eating style shop. 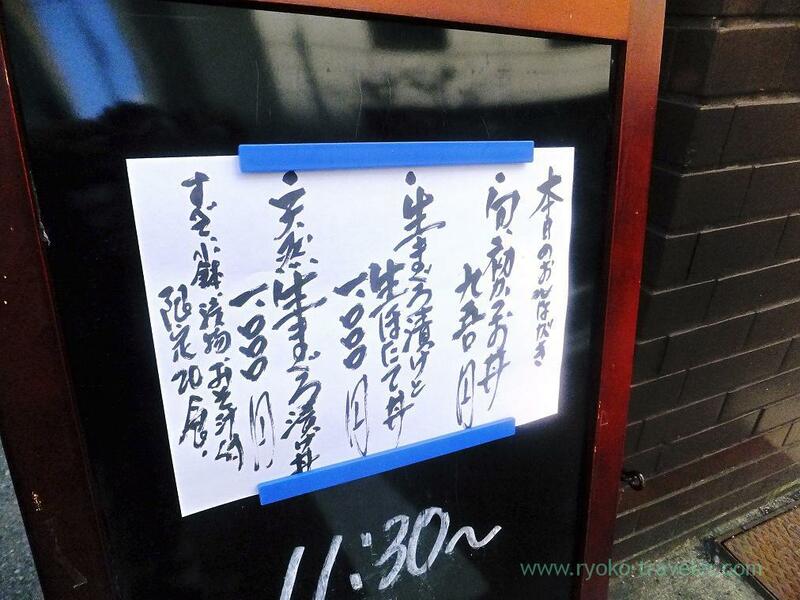 He put daily lunch menu in front of the shop. I took time to choice, and I decided to eat Hatsu-gatsuo with the word “The best season” on the menu. “Hatsu-Gatsuo” is usually translated as “First bonito” in English. 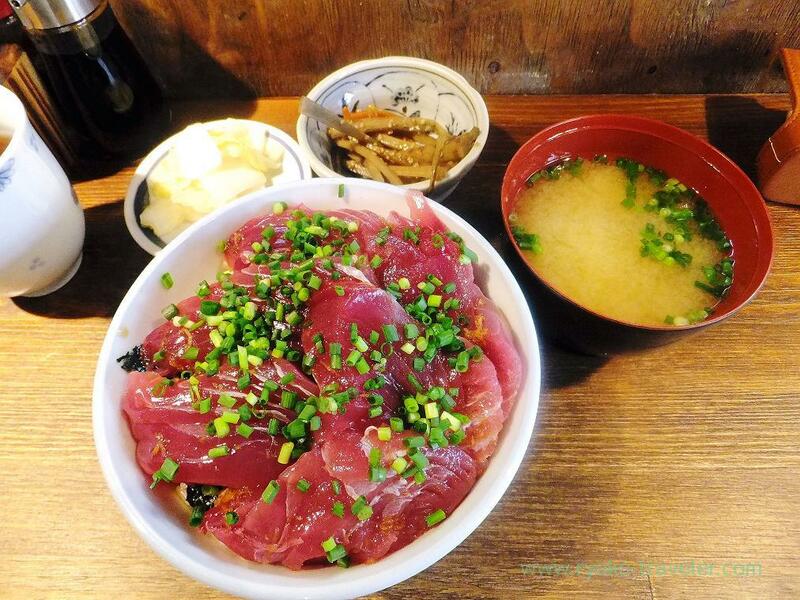 Originally, bonito is caught in Spring and Autumn in Japanese waters. So bonito caught in Spring is first bonito of the year, and it is called first bonito. Bonito is fish that travel in schools in the sea. During this season, bonito is going up from south to north in pacific ocean and they go through Japanese water just now. So, fishermen catch those bonito. By the way, Bonito caught in Autumn is called “Modori-Gatsuo” in Japanese. It is translated as “Returned bonito” in English. First bonito is said to be not fatty and tasted light, and returned bonito is fatty and some of them tasted like O-toro. Well, now is Spring. Hatsu-Gatsuo is there. It looks like lean meat of tuna and certainly it tasted light.But it was enough fatty. Shiny. 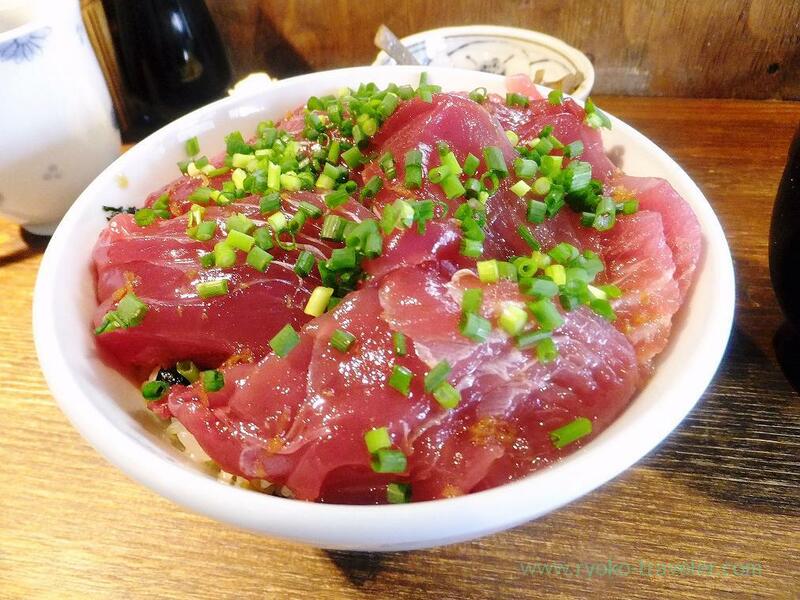 Six thick slices of bonito on the rice. It was a gorgeous lunch enough to take 40 minutes walk to the shop and back. And I spent about 20 minutes in the shop. He takes only 3 minutes to serve dishes. So, I manage to eat up every time. I just said that bonito is caught in Spring and Autumn, but now bonito is caught all year around because bonito is caught in many places in Japan from the effect of global warming. And fishermen go to catch fishes as far as they can. So there are some various definitions of first bonito and returned bonito. It differ by industries. But basically, first bonito is caught in Spring and returned bonito is caught in Autumn. It won’t be changed.